X-hibit A: LACMA's 50 for 50 ... Things to See in L.A.
About a week ago, I promised you (and myself) that I was going to finish up the #AtoZChallenge, a blogarooni thingey designed for the month of April. Ugh, it's somehow June and I still haven't wrapped it up. My last #AtoZ post was W and Walking in LA because some of us, yes, even in LA do. I embellished that post with David Hockney's Mulholland Drive: The Road to the Studio, one of my favorite Hockney pieces. 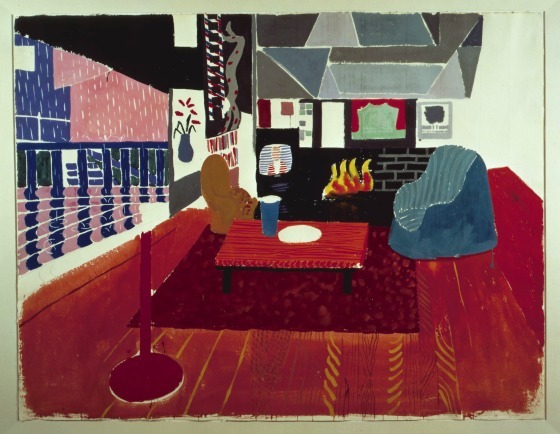 The piece lives here in LA, as Hockney has for years, on the third floor of LACMA's Art of the America's building. Although as far as I know, David Hockney never lived there; something about the lack of a bed and possibly a swimming pool. Yes, he left Los Angeles for awhile, went to Birmingham but he's been back at his Hollywood Hills studio since 2013. Part of Mulholland Drive's POW! power is how massive the piece is, at 7 feet high by 20 feet long, it stops you in your tracks. There's no way to escape it and why would you want to? Living here, one is wistful for Hockney's prettied up depiction of the route along the Hollywood Hillside road; it not only takes me to the Los Angeles I wish existed, it reminds me of the Los Angeles I sometimes think I see in my own rearview mirror, patches of possibility, dreams and hopes fulfilled around the next corner; a curvy road alive with the color the viewer chooses to imbue it with. It's a piece that never fails to make me feel good. Glad to be alive in this crazy place that's always in decay but always recreating itself too. Just as there are always new boys and new girls in town, chasing down their dreams, there's a new Hockney in town. Part of LACMA's 50 for 50, a celebration of the museum's 50th anniversary, Studio Hollywood Hills House, 1982 is currently on display at LACMA in the Resnick Pavilion, a 'promised gift' from David C. Bohnett. Which I guess means that up to now, this lucky guy has had the piece in his own collection? I don't know much about art, or dealings of the art world, but I know what I like and I like Hockney. Fresh, contemporary with roughed-in splashes of details that pull you in and in. I can't help but notice the picture of the vase of flowers hanging on the wall, and whether Hockney intended it or not, brings to my mind, Picasso's Hands with Flowers, an art print I had hanging in many of my own apartments before I finally tossed it. The frame was 70's brass and outdated, the glass cracked from one too many moves, the print faded, but like Hockney's work, it always drew me in. How something so simple can be so powerful, I'm not sure. I can't explain art; I can only feel it. 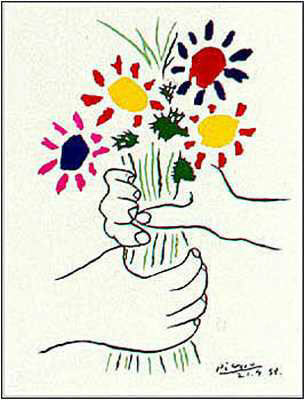 Hands with Flowers, sometimes dubbed the Peace Bouquet in NOT on X-hibit at LACMA but so many glorious pieces of art are. I'm lucky, I live across the street. I have a membership, courtesy of my son, so I can go running over any time I like. What I'd like to suggest is that when you visit Los Angeles, you carve out a little time to visit LACMA too. It's not the first place most tourists visiting my city go to, competing with the glitzy likes of Universal Studios and family faves like Disneyland, but it needs to be high up on the list of places to see. Especially right now when the 50 for 50 X-hibit is up. Looking for famous names? How do Edgar Degas, Henri de Toulouse-Lautrec, Edouard Vuillard, Claude Monet, and Andy Warhol strike you? And don't forget Mr. Hockney. There's my contribution for the letter X. Cheating? Who needs the letter E in exhibit, especially if you're tweeting? Things to see in L.A.? LACMA has plenty to offer.